My breakfast today since you asked. Turkey patties. Mango and strawberry rice. Pouched egg with avocado and tomatoes. I never eat eggs without avocado. 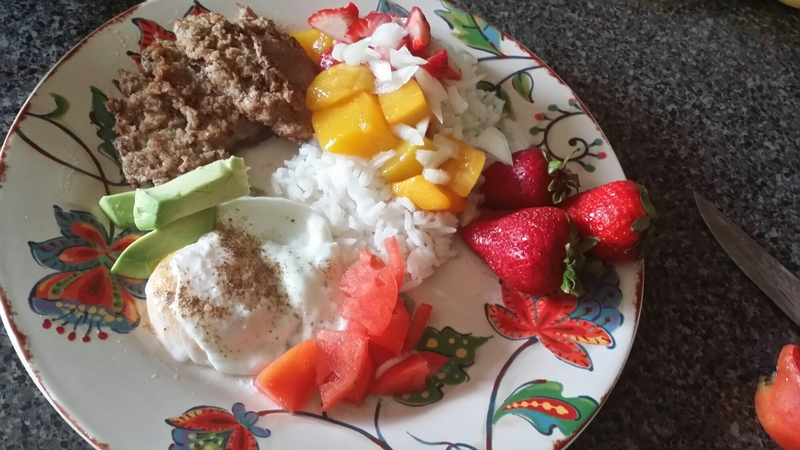 This entry was posted in Fit and tagged breakfast, fit, weightloss. Bookmark the permalink. What an excellent breakfast! I started having large breakfasts (meaning they include meat) about two years ago when I couldn’t adjust to the time change and was up early every morning. Huge improvement to my day! I learned it really is the most important meal. All the best to you. Thank you. It has changed my life.